When asked to contribute some writing about the Vancouver cocktail scene to ShakeStir, I figured the best way to begin is, well, at the beginning. My beautiful city of course has its history of saloons and beer halls, and yes, Canada even had a Prohibition, which was different for each province, and thankfully ended in British Columbia in 1921 after being a complete disaster and lasting only four years. This year brought about extremely strict government regulations, many of which are still frustratingly in place today. For example, it's only relatively recently that credit cards can be used in a liquor store, that non-government liquor stores have been allowed to exist, and that one can order a drink without ordering a meal. The archaic system by which we distribute liquor in the province is why it's so expensive, and sometimes impossible, to get so many good products. I digress. This being a cocktail site, I went back as far as I could to find original Vancouver cocktails, and only came up with two - both from the 1950's. We begin with "The Hotel Georgia." 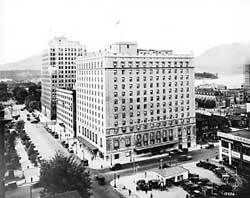 Built in 1927 in the heart of downtown Vancouver, The Hotel Georgia was the swankiest spot in the city, and housed many famous guests over the years, particularly in the music scene as Hornby Street half a block away was home to all the top music clubs in town. Elvis Presley, Louis Armstrong, Nat King Cole, and The Rat Pack were just some of the guests through to the 1960's, around the time that Vancouver stopped being part of the regular big tour schedule for major artists. The Hotel Georgia was also the only hotel in Vancouver at the time that allowed people of both "colours" to stay, mingle, and yes, even drink together in the same bar, making it home in particular to The Rat Pack every time they toured here. Vancouver in the 1950's was a haven of jazz and burlesque, particularly at the top club in the city, The Cave, which was the first to be granted a legal liquor license. 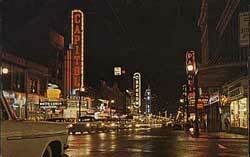 The shows were famously elaborate and Vancouver crowds were famously difficult to arouse. Las Vegas showgirl productions were actually audience-tested first at The Cave before being brought to the strip. Another connection to Las Vegas that many don't realize is that Vancouver was actually the "Neon City" first, and in 1953 had over 19,000 neon signs before city laws prohibited their use in the 1960's. That many lights reflecting off rain-soaked streets was a much talked-about sight to see. Famous jazz acts always passed through Vancouver and played with The Cave's house band, and many also played inside The Hotel Georgia itself, which until 1941 was also home to a music radio station that broadcast from the top floor live shows that were happening in the jazz clubs downstairs. Let's fast forward again, when The Hotel Georgia was closed in 2006 for renovations, then finally reopened in 2011 as the Rosewood Hotel Georgia, and I can easily say that it is one of the coolest places in the city. Aside from its beautiful design, including historic mahogany walls and marble flooring in the lobby, and one of the country's largest private collections of Canadian art, it has three (soon to be four) places to drink. The 1927 Lobby Lounge, the manager of which was the late Derek Vanderheide, is a well-stocked and well-staffed bar sitting up a few steps in the corner of the lobby, offering sophisticated drinks and high-end spirits. Reflections is a patio lounge on the fourth floor of the hotel with cabanas, fire pits, views of the city skyline, and a much more summer-friendly drink list. Later this year, a music and dance club called Prohibition will be opening in the basement of the hotel, featuring a lot of jazz and another craft cocktail bar, both in honour of the hotel's 1920's roots. Lastly, Hawksworth Bar & Lounge, recently cleaning up at the Vancouver Magazine Awards winning multiple restaurant and bar awards, is the flagship of the hotel with amazing food, and a very solid bar program run by Brad Stanton, Vice-President of the Canadian Professional Bartender's Association. The menu has some very solid, creative but simple originals, and a selection of classics as chosen by each of the bar staff by name. The spirit selection is great here as well, even featuring a handful of mezcals, which is happening more now in Vancouver but was previously unheard of and is still uncommon. If you find even 10 minutes to stop by, the menu features small-sized house aperitifs and digestifs that are perfect for starting or finishing your evening. The Hotel Georgia cocktail is speculated to have been created at the hotel itself in the 1940's, but it isn't until 1951 that it is first mentioned in print, in Ted Saucier's book, "Bottom's Up" a fun, and very dense collection of over 200 cocktails along with some risqué illustrations. The book is home to a lot of bad drinks, a lot of celebrity drinks, a few really great classics, including The Last Word, and a few forgotten gems, like The Hotel Georgia (complete with a sketch of a naked woman). The 1951 version is much too sweet and perfume-y, which likely has a lot to do with what the ingredients were like at the time, using 2 ounces of gin, 1 FULL ounce of orgeat, ½ ounce of lemon juice, 10 drops of orange blossom water, and an egg white. I made this at home and could barely handle how sweet it is. Brad altered the recipe for today's tastes, reducing the orange blossom and orgeat, increasing the lemon, and choosing specifically Plymouth gin, "resulting in a silky, stimulating and balanced beauty of a drink to be true to the light, floral, and elegant style of the original." The garnish is what really sold Brad's version to me, as the spice of the nutmeg on your nose as you sip really cuts down the sweetness. 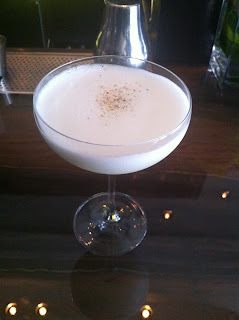 It makes an excellent dessert cocktail at home, but if there are any bartenders reading this thinking of making it at your own bar, there is a new tradition: if you make a Hotel Georgia, you must serve it on a Hawksworth Hotel Georgia coaster, so ask for one and make it properly! Combine ingredients, beginning with egg white, and dry shake. Add ice then shake vigorously for about 20 seconds. Double-strain the mixture into a cocktail glass and grate a little nutmeg onto the surface of the drink. To pair with your Hotel Georgia from 1951, I'm going to come back to the Las Vegas and Rat Pack-Vancouver connections and go with Frank Sinatra. Specifically, I'm going with one of my favourite drinking songs (the one after which I in fact named my blog), "One For My Baby, And One More For The Road," from the 1943 musical, "The Sky's The Limit." Recorded more times than we can count, Frankie's are my favourites, the most famous of which is the 1958 one from his extremely sad "Only the Lonely" album. This one is my favourite overall, but since this drink is light and sweet, I'm going with his much happier first recording of it from 1947. See you at the Hotel Georgia. Enjoy!